Whether you’re new to points and miles, or have a lot of experience, it is important to know where to get your credit score. For newcomers, your credit score will show you if you need to work on repairing your credit first, or if you’re ready to jump in with a great rewards card. Those of you who have been around should know the importance of routinely monitoring your credit for any fraudulent activity. For newcomers, seasoned pros, and everyone in between you should know where to get your credit score. That way, you know the likelihood you’ll be approved for a new sign-up bonus. There’s a few great ways to get your credit score. Where you choose to get your credit score will depend on a number of factors. Are you looking for just the number? 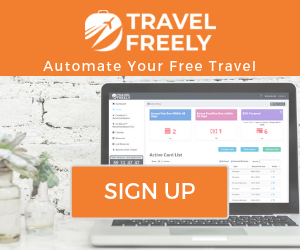 Are you curious about your 5/24 status (hint: if so, you can use Travel Freely to find out for free)? Or are you wanting to dig deep into the details? All of these are legitimate questions that can be answered by your credit report. Let’s look at some of the most popular ways to get your credit score and the benefits of each. Get all three credit reports annually, for free! 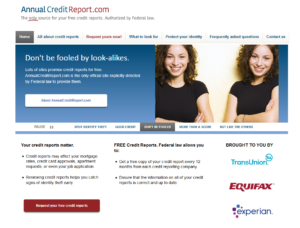 If you’re looking for the most detail when you get your credit score, you should check out annualcreditreport.com. Did you know the federal government permits you to get your full credit report from each credit bureau once a year for free? The only place to get your credit score and reports from all three bureaus for free is annualcreditreport.com. 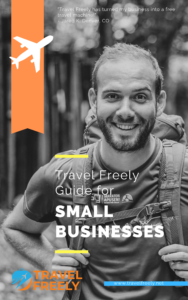 For beginners to points and miles, this is an invaluable resource. You can see everything on your credit report – and you may be surprised to find some inaccurate information. If you do, be sure to dispute it before you start applying for travel reward credit cards. You’ll want to be sure your credit is in tact first. Advanced free travelers will still want to get your credit score and reports annually to check for any discrepancies. The more cards you have, the more risk you face of identity theft. However, with a diligent watch over your credit you likely won’t run into any issues. Be prepared, the credit reports you get may be very long and detailed. But it is important to go through all of them. I recommend doing this once per year, even if you’re not involved in points and miles. Don’t assume that just because you have a good credit score means that there’s nothing wrong. Look over your reports every year. The biggest limitation with this service is that you only get it once per year. All three bureaus will try to get you to sign up for their paid service, but don’t bother. While this is the most comprehensive credit report you can get, there are others out there that will be helpful and free. Discover has a free tool called the Discover Credit Scorecard that will give you a FICO score every 30 days. We also recommend CreditKarma.com for monitoring your credit factors, but Discover’s tool has proven to be much more accurate for the actual credit score. This tool can be a great way to monitor your credit score throughout the year. Sign up here for this free tool. Note: You do NOT need to be a Discover card holder to sign up for this service. Credit Karma is a great resource to get your credit score approximation, and see a good overview of your credit profile. Why do I say “approximation?” I call it an approximation because on Credit Karma, you’re not seeing the same score that lenders use. Credit Karma uses a credit calculation called “VantageScore.” Lenders typically use FICO to calculate your credit score. There are enough differences between the two to cause a discrepancy, but generally it is quite small. If Credit Karma isn’t giving you the same score that banks use, why would I recommend using Credit Karma? Because Credit Karma still gives you a solid picture of what is going on, and I tend to find that your VantageScore will be lower than your FICO. So if you see a 700 on Credit Karma, more than likely your FICO score is higher than that. It isn’t always the case, but is a good rule of thumb. Additionally, Credit Karma provides a lot of great detail. What if you suspect that someone has stolen your identity? You can monitor your credit reports for Transunion and Equifax on Credit Karma. You can see individual accounts, when they were opened, and all the same detail you get on your credit report but in an easier to digest interface. For general credit monitoring, Credit Karma is great! You should be aware that even among cards offering your FICO score, you may see a difference. The banks update their information at different times throughout the month, so don’t fret if your scores differ among issuers. The scores were probably just updated at different times, and unless you’ve had some major changes they should be fairly close. You won’t find any extra information when you get your credit score this way. But it is a fast and easy way to check your score before you apply for any new cards. These are some great ways to get your credit score for free. You should definitely know your credit score and monitor your reports for any activities. Have any questions about credit? Join our Travel Freely Group on Facebook where our community will help answer any questions you may have.